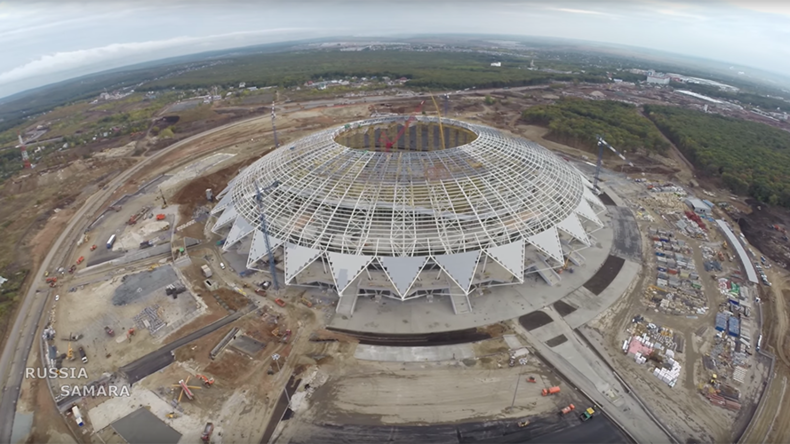 February 22 – Construction delays at the new Samara World Cup Arena have been resolved according to Russian Deputy Prime Minister Vitaly Mutko, with test games now rescheduled for end April. Mutko was visiting Samara to follow up on assurances that had been given to FIFA president Gianni Infantino about the delivery and readiness of the venue. The first test match has been scheduled for the end of April, rather than April 7. The roof of the 45,000 all-seater stadium is about to be completed. Samara will host six matches, the group stage games Costa Rica – Serbia (June 17), Denmark – Australia, Uruguay – Russia and Senegal – Colombia (June 28), as well as a second round game and a quarter-final. Last Month Mutko had reiterated that Russia is on course to deliver the required infrastructure and facilities on time. “On the whole, we have a clear-cut schedule on the completion of works, we must be fully ready with the infrastructure by April 1 and we will be able to hand over everything to the LOC and FIFA by May 31,” said Mutko. The World Cup will kick off on June 14 at the Luzhniki Stadium in Moscow with hosts Russia playing Saudi Arabia in the curtain raiser.